I would love for your organization to donate me with the funds that I need to purchase more supplies. I have purchased some things to start with, which where expensive but I am trying to pursue a dream. Being a wife and a mother of three leaves me no room to work a regular 9-5 and I need to help out financially for my own piece of mind. 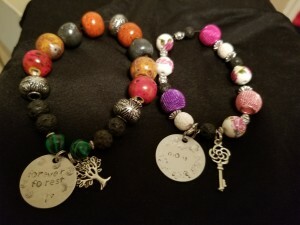 Forever Forest Hand stamped Keepsakes are created for people to have something to remember a love one by, or someone they love for a reminder of their love. I will use the funds to purchase more metal stamp designs, different metals to stamp on ( gold plated, sterling silver, etc), and different sizes blanks. I would also use the money to build my website up to promote and advertise my business to increase sells. This would allow my hand stamping business to grown financially which would allow me to start saving and begin working on my piano school. Creating something with your hands from the heart for people who like to keep it simple is the most enjoyable thing you can do.